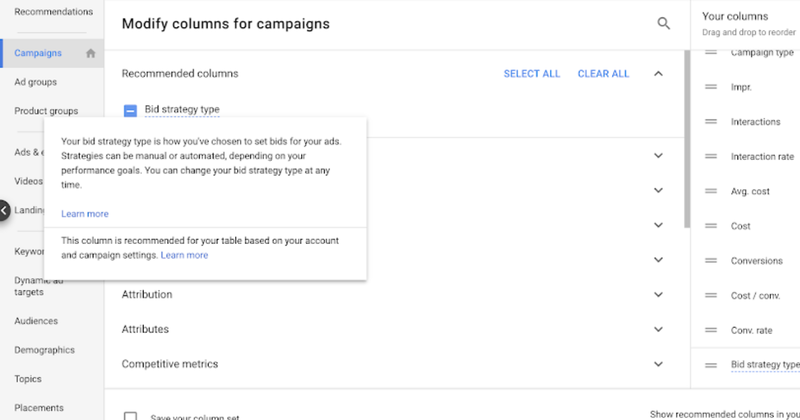 Google Ads is introducing a new “recommended columns” feature, which will highlight the columns of data that are worth paying attention to. Reporting columns will be recommended to users based on their campaign and account settings. Yes, that means users will have a choice when it comes to adding the ‘Bid Strategy Type’ column. Previously, ‘Bid Strategy Type’ was a required column in all campaign reports. Now, users can decide not to show it, which will free up some horizontal space for viewing more of the statistics columns. When adding or modifying columns in a campaign report, Google’s recommended columns will be underlined in blue. You can see an example in the image above at the top of the page. Users can either add a recommended column or tell Google not to recommend it anymore. Alternatively, Google’s recommendations can be ignored. There’s no need to acknowledge them. Column recommendations are turned on by default for all Google Ads users. Recommendations can be turned off completely, or users can turn off recommendations for specific columns. For what it’s worth, Google suggests keeping the recommended columns feature turned on. It will help users ensure that important columns are turned on, and can help users discover new columns they weren’t previously working with.